Adam's Antics » Bonaire: Safety, Safety Safety! One of the greatest things about Bonaire is “Dive Freedom.” You can do what you want, when you want. If you want to take six tanks in your car and drive to the southern-most beach and dive alone from dawn to dusk, or dusk till dawn, you are more then welcome to do so. There is no “dive master” or “dive police” to make sure you don’t kill yourself. One night, a group of four of divers decided to night dive at “Alice in Wonderland,” a southern dive site in Bonaire. We arrived at the dive site about 30 minutes before sunset, assembled our gear, and entered the water just as the sun disappeared over the horizon. It was dark – very dark. We descended and started our dive. One of the basic rules of diving is to carry a primary and backup flashlight (torch) with you on a night dive. Some dive lights are not brighter than your average hardware store light; others are $1500 HID lights that are brighter than your car’s headlights. Each member of my group had a primary and backup light – each member but me. I don’t carry a light during night dives because I carry a huge underwater camera that takes two hands to control. The camera has two strobes and each strobe has a “modeling” light built in that when left on gives out a decent amount of light. Basically, the camera is my primary light. I did not carry a backup on this dive. Since being certified in 2001, I have logged almost 300 dives. This usually makes me the most “experienced” diver in just about any dive group. At the dive resort in Bonaire, I had been certified longer than most of the instructors. While there are thousands of divers with more experience than me, I don’t run into them often. This means I usually lead dives and people look to me for direction and guidance. I am a professor by profession and don’t mind this. I enjoy teaching and leading, although sometimes I just want to be left alone to do my photography. So, we were off on our night dive… It was amazing! This was my fourth night of diving on the trip and our group was finding one specimen after another for me to photograph. Until then, I had been very disappointed with what I was shooting underwater. I was not getting the pictures I wanted to get, but this dive changed it all. Moray eel, sea snake, huge lobsters, they were all there and almost posing for my pictures. It was bliss . . . until about 20 minutes into the dive when I checked my “Smart Com” dive computer to check my air, bottom time and depth. A feeling of overwhelming shock quickly halted the bliss: my dive computer was not working. It was giving me strange readings, none of which made sense. The computer had a serious malfunction and there was no way to correct the problem. I had no idea what my depth or dive time was, or even how much air I had left in my tank. I was diving blind. I turned to locate my dive group. “Oh, that’s right,” I thought. “I swam away from them a while ago to follow a sea snake, or maybe it was an eel.” Luckily I quickly found them. We were only at about 25 feet so I signaled them to surface. I told them what happened and we all agreed to abort the dive. “Follow me back to shore,” I stated as I took a compass reading. The surface current was strong, so we re-descended and the group followed me towards shore. I was fairly comfortable that the amount of air I had left in my tank would last me to the shore. We were only about 20 minutes or so into the dive and somehow I have been using less air recently. I frequently can get 45-65 minutes from an 80 cubic foot tank of air (depending on depth and workload). Underwater photography is hard; at night it is even harder. The camera takes longer to autofocus, and there are many other complications with low-light photography. After about 10 minutes or so with Mr. Lobster I continued to lead my group toward shore, or so I thought . . .
“QUACK! QUACK!” I heard behind me a moment later. A diver in my group was activating their underwater dive signal (it sounds like quacking) to get my attention. 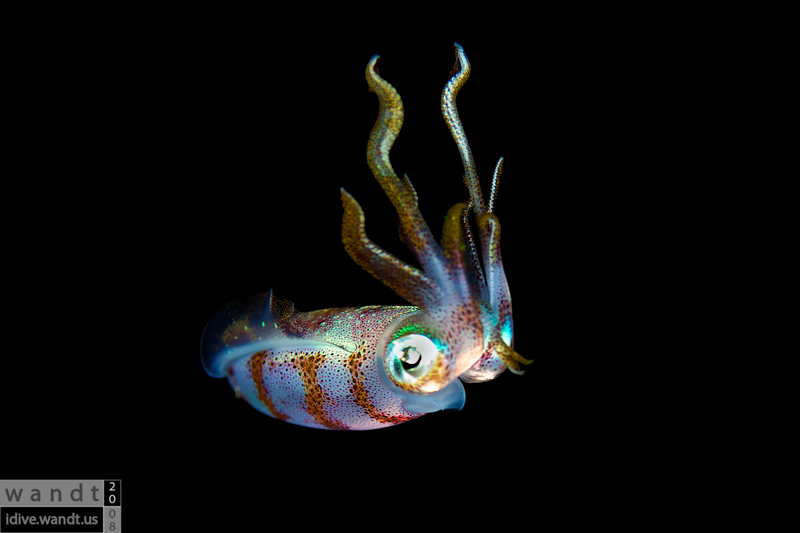 I turned around and there it was as beautiful as could be – a Caribbean Reef Squid. These creatures are small (only a few inches long) and very difficult to find at night. They hang out between 15 and 25 feet of water, isolated from reefs and other fish. These squids are beautiful at night. Their bioluminescence makes them glow under the dive light and they make gorgeous photographs. This was the opportunity I was waiting for all week. I had found what could have been a prized shot. Yes, it was irresponsible, but sometimes you need to take a chance to get the shot you really want. I remember thinking “I am only at 25 feet. If I really run out of air, I can make it to the surface okay.” In retrospect, I was probably right. The small squid was amazing. The bioluminescence was far more beautiful than most people expect. I had actually found a reef squid two days before during a night dive, but had to abort the dive after only three pictures of it because a membe r of my group ran out of air. She was a new diver and was not paying attention to her air supply. Sometimes I take chances with my own safety – but never with others. There I was with the squid, my camera, three other divers, no clue how much air I had left or what depth we were at and so, no idea of what our remaining bottom time was. Yet, none of this mattered. I wanted a great photograph of the squid and even though I knew it might take 5-10 minutes to get it, I was committed. My group watched in awe as the small creature swam while being photographed. I put my thumb up to my nose and wiggled my fingers, a “custom” dive hand signal to my buddy to approach any object I was photographing from the opposite side and shine her light on the subject. Backlighting at night was a new technique I was trying. We must have spent ten minutes photographing the squid. At one point, one of the divers in the group reached out to see if it would land on his hand. It didn’t; but it did “ink” and dart away a short distance. Because I was looking through my camera, I never saw this. But the members of my dive group said it was beautiful. Most people don’t understand how hard it is to get a great photograph in these types of circumstances. It is not a “point and shoot” situation. Shots like this require multiple shots with many different manual adjustments to the camera, strobes, angle of shot and several other factors. Plus, focusing at night with a macro lens is not easy at all. In the ten minutes we were with the squid, I took 20 or 30 photographs. I was pretty sure I would get 1 or 2 that would have been of a high enough quality to meet my standards. After about 10 minutes, my group insisted we leave because of my failed computer. Even though I really did not want to, I did. We swam away from the squid, leaving it behind. I was very disappointed I did not have more time with the squid. Had I not been having problems – I would have spent as much time with the squid as I had air. I led the group for a few more minutes at about 15-20 feet. I was getting worried. The depth was not changing. The water should have been becoming shallower, but it was not. The group surfaced. We looked for the shore and the cars parked on the side of the road. I could not see anything. If you imagine the shore shaped like an elongated “C,” we were somewhere in the middle of the “C,” but I could not tell where. We discussed our options. All four of us thought the beach was in a different direction. As the dive site was on the southern side of the island, which is nothing more than an enormous salt flat, there were very few visible lights to guide us. If we went in the right direction, we could have been back to shore in only a few minutes. If we choose poorly, it could have taken 30 minutes to an hour to get back to shore. Or worse, we would never get there. It all looked the same to me, which was black. I had to admit to the group I was lost. I wanted to swim towards some red lights on top of a radio tower, knowing there would be land in that direction, but not knowing how far away it was. I am very lucky we didn’t. I have no problem diving by myself day or night. I had done so several times on the trip already. But, this is one time I was lucky to have other people with me. Had I been by myself, who knows what my fate would have been? I carry a large variety of emergency equipment while diving, but the only thing that helps at night is a signal strobe and flair. The issue with the signal strobe was that no one would have been looking for it. What good is activating an emergency strobe on my vest if no one was looking for it? It probably would have made my night vision even worse, so I decided against it. My only other option was a single hand held aerial flair (the type small boats carry). But again, no one would have been looking for it. I figured its purpose was not for people to see it, but to attempt to light up the night sky so we could get a better glimpse of the shoreline. (I saw the technique used by the military while fighting during a movie I once saw). The downside to this plan was that if we used the flair and still could not figure out where the shore was, we wouldn’t have another one to signal a boat if we saw one. But then, like it was no big deal at all, two members pointed in the same direction and said, “The shore is that way.” It was actually kind of humiliating. I am not used to being that helpless. I graciously said, “I’ll follow you,” and they lead us back to the shore . . . that was, maybe, 100 feet away. Broken dive computer and all, we schlepped our equipment onto shore. It was not where we entered but it was good enough. I rested my camera on some dry coral and threw my equipment onto the sand. I was happy to be back on dry land. Two of us went to get the car, while the others waited with the equipment. The vehicles were only about 300 feet north on the dark island road, with skies so overcast that not even the moon was visible. The ride back to the resort was… quiet. I am currently writing this in New York traveling on the Metro North Railroad. It is sunset and the rail runs parallel to the Hudson River. Looking at the water makes me remember how much fun we had last week. I missed the island almost the minute we left, even though I always am happy to return home.